Oh honey! The Baking Sheet is hosting this Sugar High Friday and the theme is honey. I decided to try palmiers. You can see what others chose to make here. Process pistachios until finely ground. In a bowl combine the pistachios, butter, caster sugar, cinnamon, 3 tsp of the Rum, and 1 tbl of honey until the ingredients come together to form a paste. Distribute half of the brown sugar on a counter or cutting board and place one of the puff pastry sheets over it. Press the puff pastry so the sugar adheres. 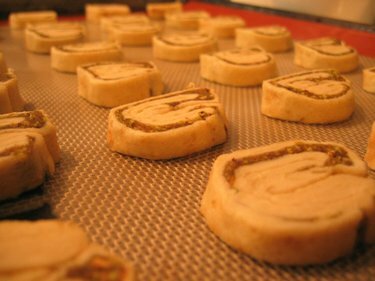 Spread half of the pistachio mixture onto the center-third of the puff pastry. Fold each outer third in to meet in the middle and press down. Fold each side in once again and press. Repeat one last time and fold each side of the resulting cylinder into each other. Cover in plastic wrap and chill for about 15 minutes or until the pastry is cool enough to handle without coming apart. Repeat with the other half of the ingredients. Remove from the plastic wrap once chilled and cut into pieces 1/4in thick. Place on a greased cookie sheet or Sil-pat mat. Bake 10-15, watching carefully near the end so the bottoms do not burn. Meanwhile combine 1/2 C of the honey with 2 tsp of the rum in a small saucepan and bring to a boil. Reduce heat. 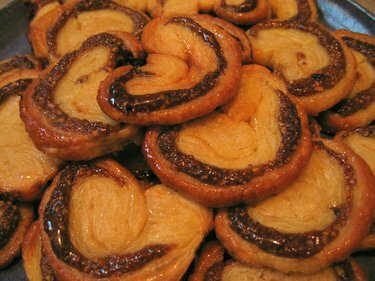 When finished baking, place one palmier at a time in the honey mixture, turn to coat, and place on a wire rack (with paper towels underneath). Allow to cool and enjoy. This was a very easy recipe and it would lend itself well to substitutions and different flavors. I do not typically enjoy things that taste heavily of honey, but I really enjoyed these. The rum and boil mellow out the sweetness and leave you with a lovely consistency. 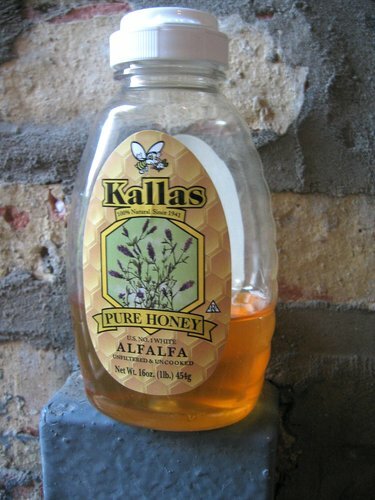 I used Kallas brand unfiltered and uncooked alfalfa honey. The alfalfa gave a subtle earthy flavor that worked nicely with the honey's natural sweetness. My roommates really seemed to enjoy these. Aviva made madelines during the day, so we had lots of sweet things to eat last night. Mmmm. These look great, rather like a light version of baklava. Great entry - and thanks for participating in this month's SHF, Gemma! Hi Nic, thanks again for hosting this SHF! Yes, they are much like baklava, my boyfriend said the same thing. I like that they are cookie-sized to nibble on. I think the flavors are also quite a bit lighter and more delicate as well. Mmmm. Unfortunately, I often am not around when Gemma is baking and since her wonderful treats don't seem to sit around very long without being eaten, I rarely get to try some. I was, however, fortunate enough to get to try some of these fresh out of the oven. As an aside, the brick wall behind the honey jar reminds me a lot of the walls in The Grind, off of Lincoln and across from the Davis Theatre. Thanks Mindy! I am glad you were over when they came out of the oven. Hi Gemma, they look fantastic, Im especially drawn to the addition of pistachios. Im glad that you mentioned that it would take well to substitutions, it looks like it would be fun to experiment with! Great looking palmiers Gemma. Heavens, there goes the diet! 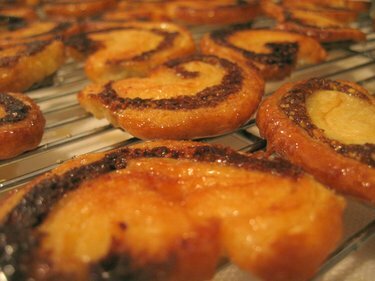 Palmiers are such a great cookie/pastry to make with honey...why didn't I think of it before now? These look delicious! Michele, I am all for substitution experiments. Let me know what you try! Thanks Ana, diets are over-rated ; ) Nice honey cake on your site. I will have to look around it a bit more. Thanks Jennifer! Your ice cream sandwichs look amazing. Thanks for starting SHF too! these are fantastic! I think these taste better a day old. I added some lemon zest to the honey/rum dipping sauce. Fantastic recipe. I'm glad it worked out well for you! I love these. The addition of lemon zest sounds great. I will definitely try that next time I make them.